CAAB is a group of committed people, who work to bring public awareness and scrutiny to the issue of the presence and roles of the US Visiting Forces and their Agencies in the UK and world wide. We are grounded in non-violence. CAAB has many supporters and contacts (here and world wide). We have no paid workers and rely entirely on donations to fund the campaign. We always welcome comment, contributions and feedback. We are also keen to encourage debate and questions. There is a witness and protest outside the main entrance to the American base at Menwith Hill every Tuesday evening (6 – 7:30 pm). This demonstration has been going every week for nine years. Menwith Hill is on the A59 Harrogate to Skipton road) and nine miles from Harrogate North Yorkshire. CAAB organises two major demonstrations a year. Held, for people of all faiths and none outside several US bases. 4th Saturday each month – 2.00pm for 1-2 hours. Contact: Elisabeth Salisbury 01865 515163.
at NSA Menwith Hill, October 7th 2014.
at NSA Menwith Hill, July 4th 2014. The demonstration that CAAB organized for ‘Keep Space for Peace Week’ at NSA Menwith Hill UK in October 2013. This is CAAB responding to the international call for a week of protest by the Global Network Against Weapons and Power in Space (GN – www.space4peace.org). CAAB has responded every year since 2000.
agreed to joined us to receive a letter for us. The letter which was signed by everyone who came to the demonstration is attached. We were disappointed that the Ministry of Defence police were again somewhat aggressive in their policing and attitude to those who crossed the illegal and contentious ‘yellow line’ which they say denotes the boundary of NSA Menwith Hill and which North Yorkshire Police say is ‘only an indication of the boundary’. We will, once again be pursuing this with North Yorkshire police as the MDP police on behalf of NYP. It was GREAT people came in support and stood firm with Bradley Manning on the grass verge on the corner of the busy A59 Harrogate to Skipton Road/turning to the American base at NSA Menwith Hill. There was lots of passing traffic and a lot of friendly hoots (one or two aggressive but not many). We gave out some leaflets (thank you WISE Up – they did arrive!) to several people who stopped. There were one or two drivers and cyclists who wanted to know what we were doing. We were very surprised when a very important person arrived (with absolutely NO bodyguards CIA/FBI etc. in tow). What a chance to ask Barack Obama, no less, some questions. I was quite surprised how sharp he was and with his usual charm and weasel words tried to sound convincing. Needless to say I was not convinced. He stayed for the whole of the two hours. At the end of the demonstration an upside down US flag with the words STANDING FIRM WITH BRADLEY MANNING was handed into NSA Menwith Hill via James Sheardown (Sergeant Ministry of Defence Police – paid for and under the operational control of the US authorities) with the express request that this be given to Christopher Gilmore (US Commander who occupies and controls all that goes on at NSA Menwith Hill) given to him by THE CAMPAIGN FOR THE ACCOUNTABILITY OF AMERICAN BASES – CAAB. We left another upside US flag which said THANK YOU BRADLEY MANNING on the GIVE WAY traffic sign on the corner where the demonstration was held. Later we noticed a man who was jogging down the road in the direction of NSA Menwith Hill and holding the rolled up flag. He was asked if he would please give the flag back. He took no notice and kept on jogging still holding the rolled up flag. He continued up the road, a photo was taken of him as this was potentially theft and as he got near he was asked again to give the flag back. He was an American from the base and said that he was taking it back to the base ‘as you usually have the flags there mam” (presumably with reference to the weekly Tuesday pm demonstration). He gave the flag back and was thanked (and given the benefit of any doubts!). Over the years several upside down US flags and banners have gone missing. We have some idea as to who has taken them. 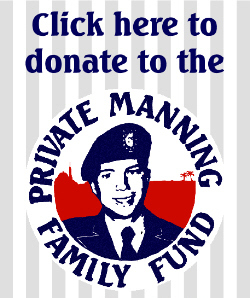 THINKING OF YOU, BRADLEY MANNING. Thank you so much to everyone who came and helped to make it possible. See Tim Everett’s photographs below. What are YOU Doing on 17-19 May? Don’t know what to do next weekend to show solidarity with the Guantanamo hunger strikers as their protest hits 100 days? We’ve produced a list of things you can do now/then – from petitions to sign, protests to join, places you can donate, t-shirts you can buy & so do something. A compelling reason for joining the demonstration below at NSA Menwith Hill. There will also be a presence at the Cenotaph in Harrogate from 11-1pm. Please consider joining either (or both!) for sometime on Saturday. This Saturday marks the 101st day of the hunger strike. Lindis Percy (Coordinator of CAAB) will be at the American base at NSA Menwith Hill on Saturday 18 May 2013. She will be there at 7 am to start a 24 hour fast in solidarity with the hunger strikers at Guantanamo. She will be dressed in the iconic orange suit and black hood of Guantanamo dreadful detention centre. If you don’t want to or can’t fast please come for some of the 24 hours or join in the fast. Demonstrators gathered at Menwith Hill last weekend to protest against the vastly increased use of armed unmanned aerial vehicles – or ‘drones’- now being controlled over Afghanistan from RAF Waddington in Lincolnshire from information gathered at intelligence bases in the UK led by Menwith Hill. We stood outside the gates to NSA Menwith Hill last Tuesday night in solidarity with those campaigning all over the world for the immediate closure of Guantanamo Bay. On this day Bradley Manning had been detained for 1,000 days without trial. A group of people gathered at the gates of the American base at NSA Menwith Hill in North Yorkshire from 11 – 1 pm, in response to the international call for action by the Bradley Manning Support Network in the US and others to mark this shocking day of his continued detention. We stood in front of the cars coming out of the base, blew whistles and held upside down US flags with messages of support eg “GOOD ON YOU BRADLEY MANNING”. It was cold and snowing. Afterwards an US upside down flag (“THANK YOU BRADLEY MANNING”) was tied on to the perimeter fence for Christopher Gilmore(Colonel US Commander of NSA Menwith Hill) and the people who work on this base; making it clear that CAAB supports Bradley Manning. Lindis Percy (Joint Coordinator of CAAB) said: “There is often a terrible price to pay for ‘blowing the whistle’ to reveal crimes and abuses going on. Bradley Manning has seriously stirred the hornets nest involving the most serious and shocking cover up by the US government and US military. He has exposed war crimes. These people should be in court. We need more whistle blowers like Bradley Manning”. The weather was kind enough to keep all of us dry on our new year’s day demonstration at Menwith Hill – although it was a little blustery. We celebrated the new year with hot soup, cakes and biscuits and a real hope for a peaceful 2013. The MDPA policing was discreet and courteous as some of us crossed the yellow line to demonstrate directly in front of the main gates. For those of you who couldn’t be there, we will be there every Tuesday evening between 6 & 8pm. Tuesday night weekly demonstration – 13 November 2012 – reflecting the welcome change of policing methods. Satellites: the eyes, ears and brains of modern warfare. Imaging satellites capture the visual images of the targets (including individual people) that warmakers wish to destroy. Signals satellites pick up voices and other sounds which further identify a target, while the GPS system provides the gunsight or bombsight which directs the bullet or bomb to its destination. All these same orbiting instruments of war help the Pentagon assess damage, often leading to more strikes repeating the same process. The addition of drones and other new age weapons bring us close to having no human being in the loop at all. There is a perception among those aware of space that most orbital activity in the past five years has shifted to the private sector, and that federal government satellite activity has declined during the Obama administration. While civilian government agencies like NASA are facing cutbacks, satellite launches have kept up with a Bush-era pace. The satellites that manage spying, navigation, targeting, and military communications are launched by agencies such as the National Reconnaissance Office and the Defense Information Systems Agency, whose budgets are larger than ever, but whose activities take place largely out of the public eye. While the satellites orbiting miles above our heads may be out of our sights, the ground stations they depend upon, in locations such as Menwith Hill, UK; Pine Gap, Australia; and Buckley Air Force Base, Colorado are vast bases that play a large role in local economies worldwide. Some photographs taken during the Keep Space for Peace demonstration at Menwith Hill. See our photo gallery of this event. Please consider donating to our work. Whatever you give, no matter how small, will help to support our campaigning work. Making a donation on-line is safe and simple. Sign-up and receive news and updates.